I first tasted absinthe in 2003. I’d heard about it well before then, but stumbled upon an article about it. The article made it sound like it was a drug — a stigma the drink carries to this day. In the past 15 years or so, absinthe has made a comeback. It’s now legal in the United States. You can buy it in most liquor stores (varying qualities). If you want a good absinthe, I recommend anything made by Ted Breaux for his Jade line. The neat thing about Breaux’s absinthes? 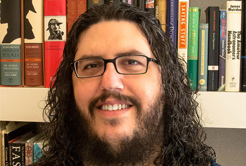 He’s a chemist and distiller, and he created his line by working backwards from samples of vintage absinthes. I can now say with confidence that he got it right! For years, I’ve been on a mailing list for someone who finds vintage spirits…with a heavy focus on absinthe. And for years, I could never justify the price of samples sold when a few bottles are discovered from the pre-ban years before absinthe was outlawed in various countries between 1910-1914. Isn’t It Supposed To Be Green? 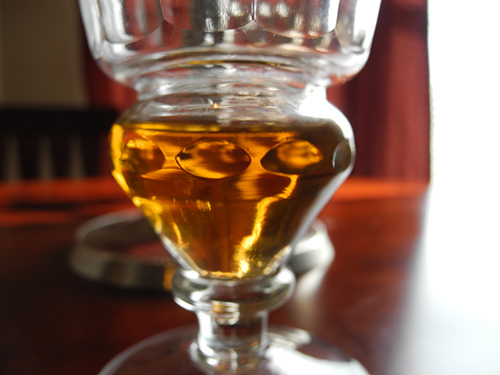 Most modern, traditionally made absinthes are green in the same way olive oil is green. It’s not a bright green, but it’s definitely green. 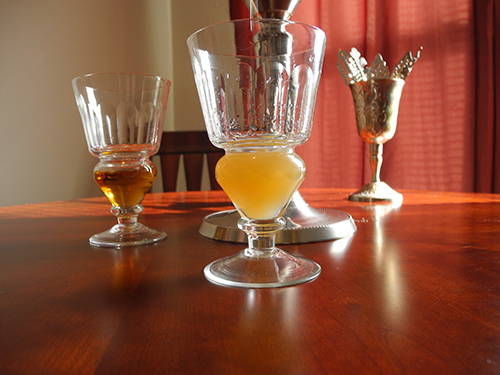 (Although some absinthes are more of a straw color, while others are absolutely clear.) So why isn’t the sample below green? Over time, the chlorophyll that gives absinthe its green hue degrades, taking on the color of a dead leaf. (Fuille morte.) Sometimes the flavor changes, becoming more earthy; other times, the taste does what many other spirits and wines do with time: they blend and end up more full and rounded. Of course, we had to go the traditional route. If you see someone set a sugar cube above a glass of absinthe on fire, don’t drink it. It’s probably a crappy absinthe served in a party atmosphere. I really don’t care how others drink something they pay for (I know someone who drowns Islay malt scotches in ice; makes me cringe, but he’s free to do with what he buys), but I’ve heard a lot of people say, “I HATE absinthe! “… only to find they drank swill that wasn’t even absinthe. For this drink, we used no sugar. Only ice water from the fountain we’ve had for almost 15 years. With the louche, the aromas open up, leaving the room smelling so fragrant. I’ve never seen it that strong. It’s more like fennel: a subdued licorice flavor, mixed with a taste of hay dust on the roof on your mouth. It tastes like fields and hills and summer distilled to its essence. It’s a very refreshing drink that some people I know who hate black licorice find pleasant. It’s big and herbal and wonderful! What Did This Glass Taste Like? In a blind taste test, I’m guessing most people who have consumed good absinthe would say it tastes a lot like the absinthes Ted Breaux makes. Not quite as earthy — the floral qualities winning out over the taste of distant hay fields and wormwood. 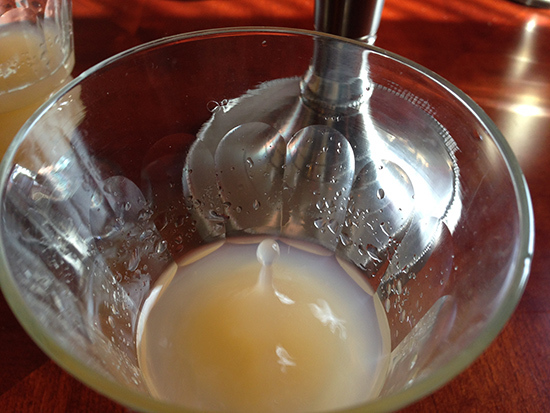 It was creamier — and the flavor lingered much longer than any other absinthe I’ve tasted. The neat taste was sublime; truly one of the best taste experiences of my life. I wanted to drink it straight — and with its high alcohol content, it didn’t have a huge attack in that sip. 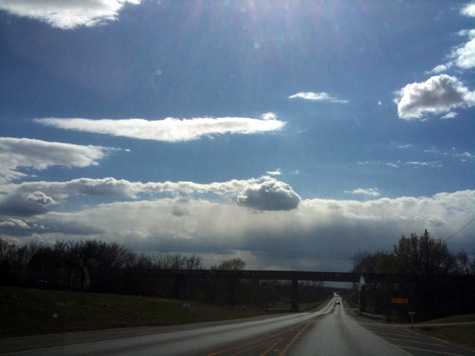 The astringent qualities seemed subdued and stronger at the same time. 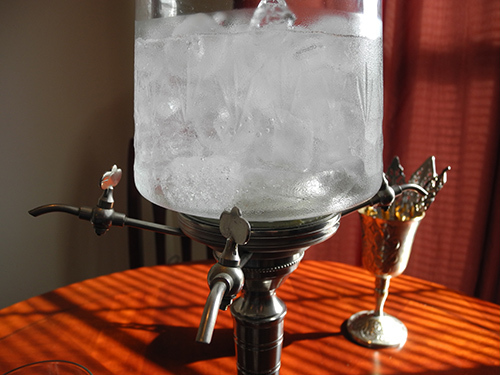 Once water was added, it was much like some of the better modern absinthes. As I drank the glass, I thought about the region where it was distilled. I wondered whose hands grew and harvested the herbs used in the drink — and who was responsible for distilling the bottle. 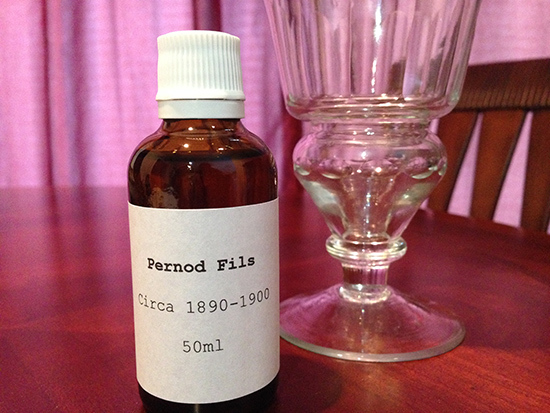 (The bottle this sample was drawn from.) I wondered where other bottles from that distilling run went: who drank them — and are there any others still out there in a cellar somewhere? Even had this drink not lived up to my taste expectations, it would have been worth it, just to imbibe something that was distilled somewhere between 1890 and 1900. 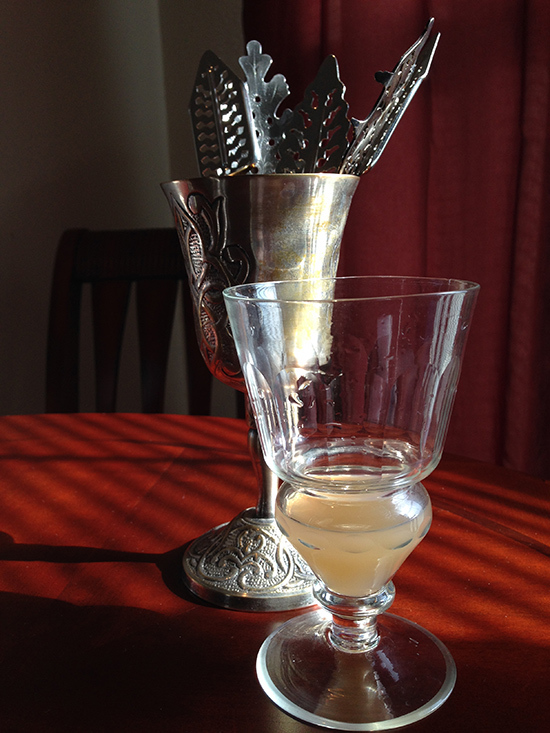 Splitting the dates, today I drank 120-year-old absinthe, and it was worth every friggin’ cent I paid for it! 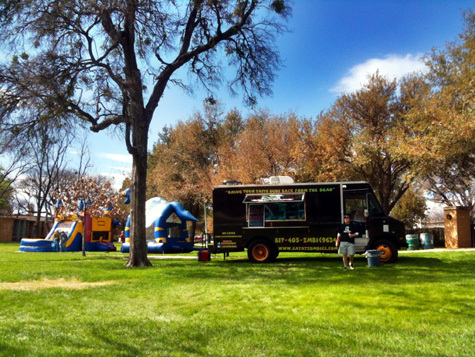 While food trucks seem to have taken many cities by storm, the Dallas/Ft. Worth area is just beginning to get a taste for the mobile goodness. 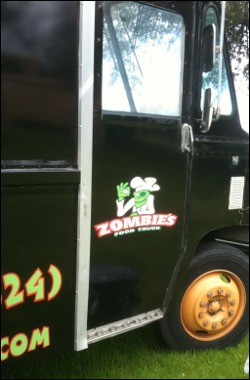 I was very happy to see Ft. Worth become the home of a vegan food truck called Zombie’s. 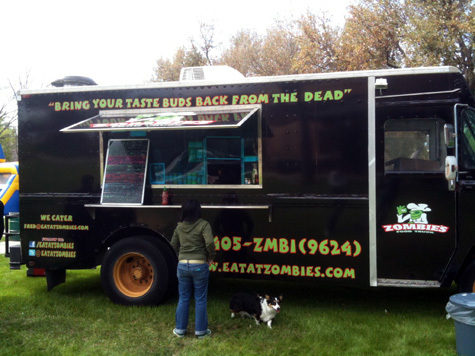 Offering a variety of sandwiches, the buzz surrounding what the Zombie’s crew makes didn’t go unnoticed by me; in short, I couldn’t wait to give their food a try. 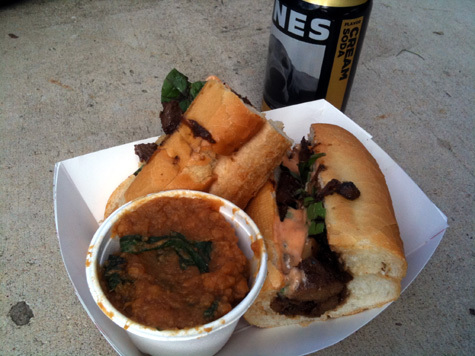 This weekend, the Zombie’s crew headed north, to Denton, Texas, where they fed hungry Keep Denton Beautiful volunteers. After that, they had public food service from 1-5. It would have been a travesty to miss out! 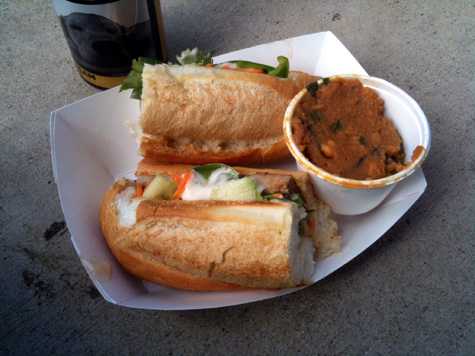 The Hanoi Polloi Sandwich in all its glory. Seriously yummy stuff! 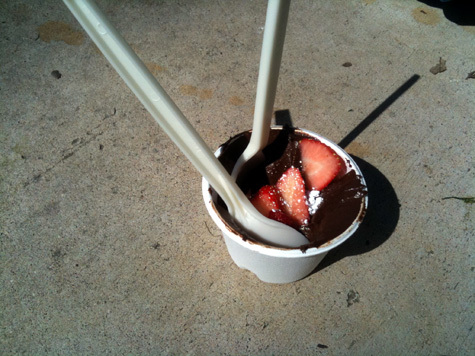 Who knew avocados could serve as the basis for a chocolate pudding? I was surprised how good it was. They did more to it than just chocolate and avocado -- it was the perfect finish to a mighty fine meal! Leaving Denton on 377 south.